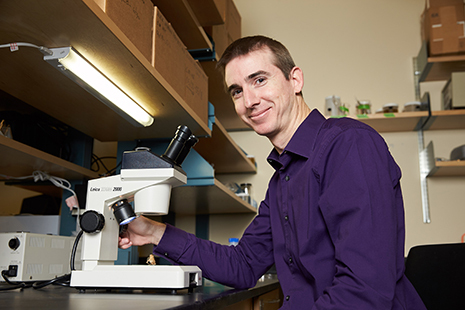 The biology at the center of one of Professor Nicholas Block’s interests is right outside your window – sometimes even clinging to your window screen ­– and offers a perfect lens through which to see the importance of science to our everyday lives. Three years after a 2015 NPR segment on a major winter moth invasion put Block in the media spotlight, the insect responsible for defoliating millions of shade trees is in the news again. With the help of entomologists, a parasitic fly from Germany that preys only on the winter moth caterpillar has slowly been gaining a foothold in the region and it is now possible that the winter moth will be eradicated in the near future. Then and now, Block sees the media attention the moths received as a net positive in so much as it gets the general public to think more about science. These were questions Block, assistant professor of biology, was well poised to answer. With background in evolutionary biology and birds, he had recently become more interested in moths and butterflies. He and his students have conducted research on dragonflies and damselflies in nearby Blue Hills Reservation that may help us better understand global warming. Martin McGovern, Stonehill’s director of communications and media relations, became aware of Block’s moth expertise and featured him in a news story and an edition of Stonehill Alumni Magazine. He also pitched an interview with Block to WGBH, a Boston NPR radio affiliate. And a radio segment was born. The resulting piece, which aired as part of WGBH reporter Edgar Herwick’s “Curiosity Desk” segment, was accompanied by an online article on the topic. In them, Block explained where the moths came from (Europe, about 15 years ago), how they became so plentiful in the region (they have no native parasites), whether they do damage (the adults don’t, but in their caterpillar stage they defoliate trees) and what can be done about them (bring in a parasitic fly that eliminates the caterpillars). The last part, of course, is what has once again drawn media attention to the issue. Block, referenced in the piece as “something of a winter moth geek”— considered a compliment in his circle—also connected Herwick with a University of Massachusetts professor who at the time was the only local expert working on that parasitic-fly solution.